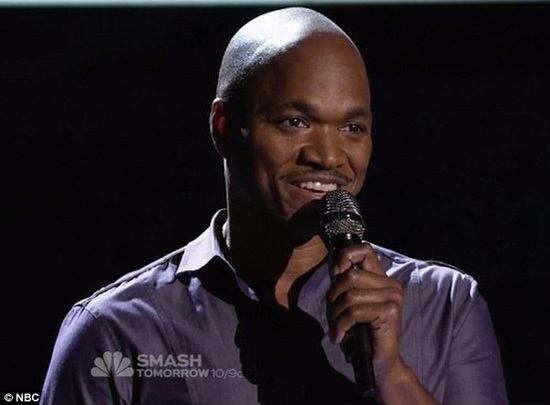 THE VOICE: Jesse Campbell – The Battlefield of Life! With the voice of a beautiful song bird, Team Christina’s Jesse Campbell blew away audiences during his battle round, which is set up on a stage surrounded by ropes like in a boxing ring, with Anthony Evans on Monday’s episode. Host Carson Daly described it as a “heavy weight battle” and “a battle of epic proportions”. Campbell took time out to answer reporters questions about his experience on the show so far. Much of the filming has been completed for this season. Only the live shows remain. “The Voice” will begin airing two-hour live performance shows starting April 3rd. Campbell said that he had auditioned for other singing shows in the past, but he was “grateful that The Voice had an ear to hear”. Campbell stated what he meant by that is “The Voice” doesn’t focus on the drama. “The Voice focuses on the voice and that’s what I’m hear for” said Campbell. Campbell said to get where is now he had to overcome low self-esteem, stating “I didn’t know what I was worth”. At one point, he and his daughter were living out of a car, Campbell said he had to give up a voice-over job in animation because they wanted a contract that would have hindered his vocal career. Once his plan B of traveling in the ministry fell with the economy crash and people stopped going to church as much. Campbell said with all of the different things he went through, “I see it as we all had to go through things”. Before going onto the show, Campbell said he really looked forward to seeing Adam, and thought he was going to pick him as a mentor before his blind audition. “I was really looking forward to Adam. I used to get the biggest crowds on Venice Beach singing his songs. But when I was up there on the stage something said go with Christina and I did and I’m glad I did”. “The Voice” airs on NBC every Monday night.